As another birthday draws near, I was thinking about what I would tell my decade-younger self. One big piece of advice I would give myself is not to be afraid to fail by taking more risks. I wish I would have studied abroad and taught English in Asia before heading to graduate school. Why was I in such a rush to have my life figured out? I often tell my students that they’ll be working for the next 25+ years and delaying grad school or a ‘real job’ for a year or two won’t make significant impact in the long run. Funny how I’ve gained that perspective many years later having been in their shoes. I can’t rewind myself back to my early 20’s, but having this food blog has challenged me to take more risks in cooking things I’m not familiar with like mussels. I was wondering the aisles of Whole Foods and came across some live mussels and thought about Chef Julie Yoon’s recipe for mussels in white wine. I was able to experiment on my lovely roommate and college friend for dinner as we were celebrating my friend’s birthday. Serve this simple, light, and satisfying dish with a toasted bagette slices or over spaghetti. Btw, Chef Julie’s how-to video was helpful in walking me through the process. 1. Clean the mussels under cold running water in the sink. Remove beards by slicing them with a paring knife. For ones that are slightly open, gently tap the hinge of the mussel on your cutting board so they close. If it doesn’t, discard. Should take about 15 minutes. 2. In a large pot on medium heat, add 1 TB of butter. Once melted, add your onions and garlic until cooked through (about 2 minutes). Add chicken broth and wine; bring mixture to a boil and add mussels. Cover with a lid. 3. Let the mussels simmer for about 5 minutes (set a timer) and shake in the middle for even cooking. At the end of 5 minutes, check to see that the mussels have opened. Turn off the heat and add parsley, tomatoes, and remaining 2 TB of butter. Gently toss to make sure the butter melts. 4. Toss any mussels that didn’t open. 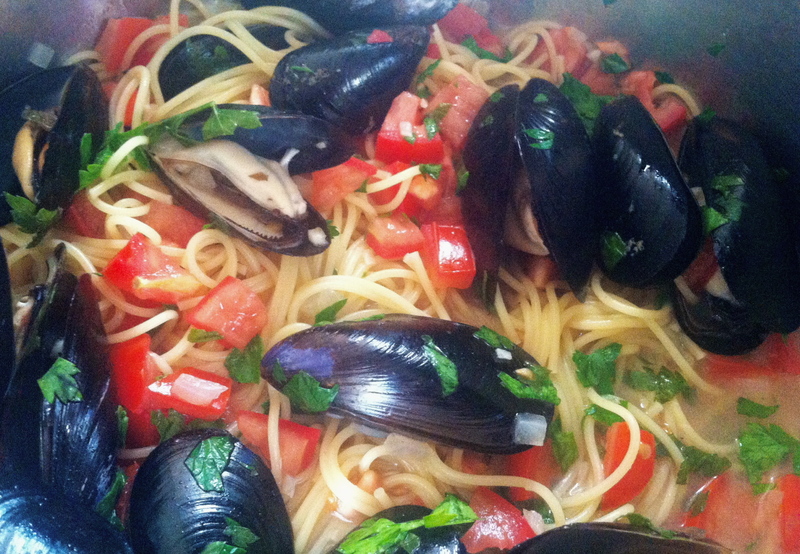 Squeeze half the lemon over the mussels and serve over pasta or with crusty bread. Note: I bought my mussels 2 days before cooking them. To keep them fresh, I kept them in the mesh bags they came in and placed them in a colander in the fridge with bags of ice. Make sure to place a Pyrex or some kind of plate to catch the melting ice. I also covered the colander with a wet paper towel and re-wet it each morning. I know it sounds complicated but I had to keep them alive before serving for optimal flavor =) I wouldn’t recommend freezing them. This entry was posted in California inspired eats, French food, good eats, Recipes, weeknight meals, wine and tagged seafood on August 28, 2014 by honeyandlimes.